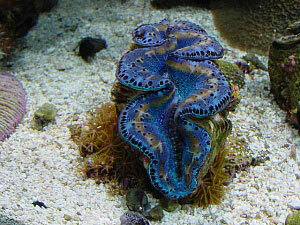 My love of the ocean and aquariums goes back as far as I can remember. 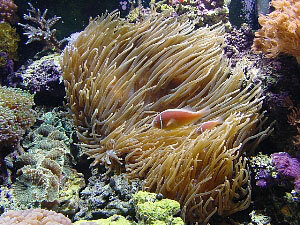 I grew up in the sportfishing industry and my first saltwater tank was stocked with fish caught off the coast of Baja, Mexico. The water I used was filtered seawater drawn straight from the Pacific at Scripps Institute of Oceanography. The tank had everything from small White Sea Bass (oops) to a two inch long Yellowtail that had been caught with bait rigs on the kelp paddies offshore. 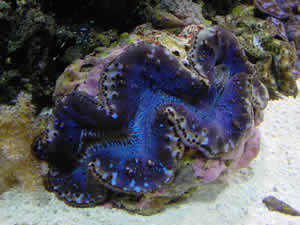 It was a great local tank, and was lots of fun during feeding time! 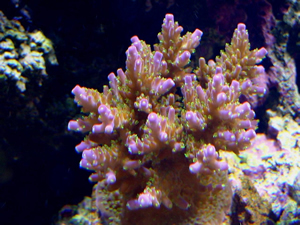 I relocated to the East Coast about five years ago, leaving my tank behind. I didn’t anticipate starting another tank, let alone a reef tank, until I was captivated by the outstanding tanks at Reef and Fin in Stamford, CT. At that point I knew I had to have another tank, and with the help of the shop’s owner, Chris Jessen, I took my hobby to a new level. Piece-by-piece, I got my hands on all the equipment I really wanted to act as the foundation of this 180-gallon aquarium. 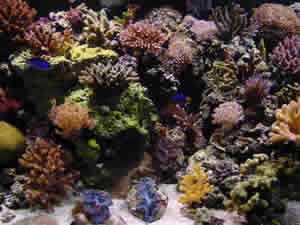 With alot of trial and error, some much needed advice, and my wife looking the other way at the checkout counter, it has become the reef tank I am sharing with you today. The tank is set up against the main wall of my family room, making it the center of attention. Three sides are viewable, while the back is painted black. Each corner contains an overflow. The lighting is a pendant design that hangs from the ceiling. The stand is built out of 2 x 4’s spaced every 16 inches with ¾ inch marine plywood used for the top and sides. It is trimmed with 1 x 4’s with two large access doors in the front, and one on the left side. 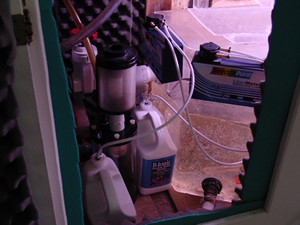 The side door gives me easy access to the pumps and skimmer, and allows me to slide the sump out the side, if I remove the skimmer. 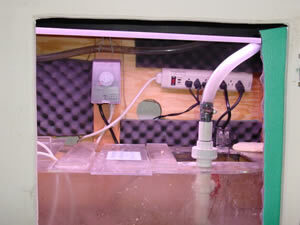 It is ventilated with two 4” fans which provides cooling for the pumps and the skimmer. I have added egg crate acoustic foam on the interior of the stand to aid in soundproofing the equipment since the Iwaki and the Mak4 pumps would be too loud for the family room area. 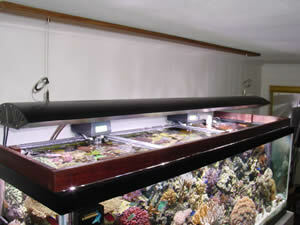 The stand is equipped with lighting for the 65-gallon sump and built to incorporate everything needed to operate the aquarium, with the exception of the chiller. The finish on the stand, an Interlux marine epoxy used for wooden boats, has held up unbelievably well over the past four years. For long power outages, I am lucky enough to have a small gas generator (not hooked up to the tank unless needed) that will run all pumps in the tank. The tank and all components are on their own separate breaker box from the rest of the house, so if the house trips a circuit, the tank will keep running. The tank is on three 20amp breakers with the lighting, chiller and pumps all having their own separate circuit. The breaker box for the tank also has lightning protection; the fuse will blow, but the components are 99.9% safe. 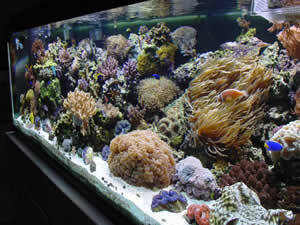 The tank is now four years old and many of the corals and fish in the tank have been with me since the beginning. 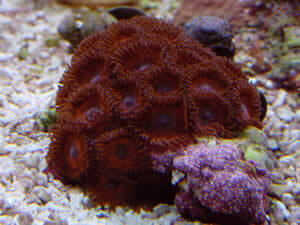 Almost all of my corals and fish have come from my local fish store in Stamford. 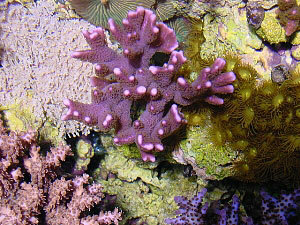 I have also traded with a few of the members of Reef Central and have received some very nice SPS frags. 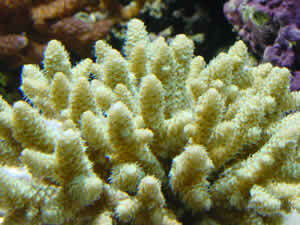 One of the biggest enjoyments I get from the tank is in witnessing the growth of the corals. 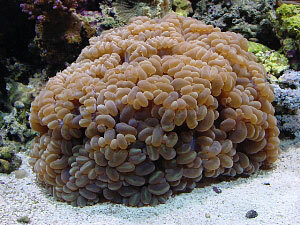 I find watching a small fragment of a brown coral as it attaches itself to the rock, and then slowly changes color to a bright purple, blue, pink or some other color, to be truly incredible. My regularly scheduled maintenance consists of cleaning the skimmer two times a week and cleaning the glass 3 times a week with algae magnets. 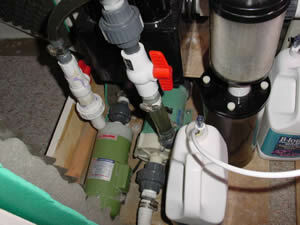 There are certainly unexpected chores that pop up occasionally, but the basic maintenance of the tank’s hardware does not require more than about two hours per week. 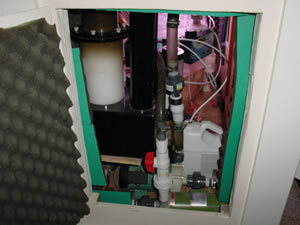 Water tests are done weekly, consisting of measuring alkalinity, calcium, pH, and magnesium. 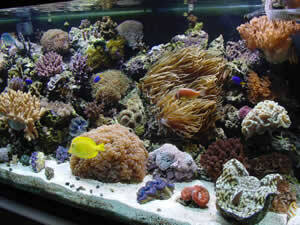 A water change of 15 gallons is performed every two weeks. Unfortunately, water top-offs have to be done manually on this tank due to the fact that it is not located close enough to an area where an automatic top-off system can be easily installed. 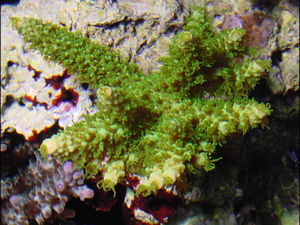 RO/DI is used exclusively and the evaporation rate in the tank is 2.5 gallons per day. As might be imagined, making sure that I have enough top-off water on hand is a constant concern. Most of the additives I use are ESV products and consist of calcium, alkalinity, magnesium, strontium and iodide. I also add trace elements once a week using CombiSan™. All of the additives are used at the manufacturer’s recommended amounts. Feeding is performed once a day in the evening, and consists of a combination of frozen Mysis shrimp, silversides, brine shrimp, and veggies (Sea Veggies™, Tenera Blue and spinach). 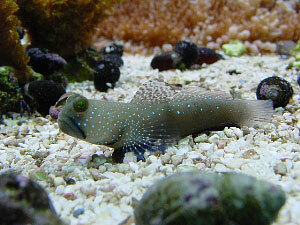 I feed dry food, a mixture of pellets and flake, every other morning. 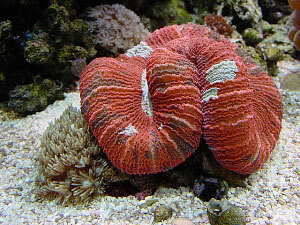 The corals and clams are given Tahitian Blend™ (frozen phytoplankton) three times a week. The only target feeding I have to do is for the seahorse. 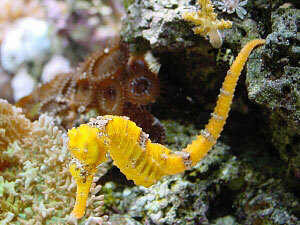 The seahorse is not captive-bred and had to be weaned from the live brine to the frozen ones. He has adapted well to the change and actually seems to ‘come to dinner’ during feeding time, always positioning himself in the same area to receive his food. 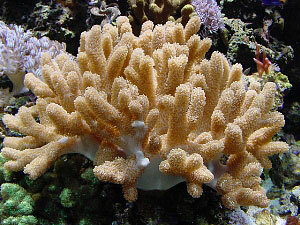 I surf through Reef Central on a regular basis and I am always amazed by the beautiful tanks and am always grateful for the tips and advise that the forums offer me. 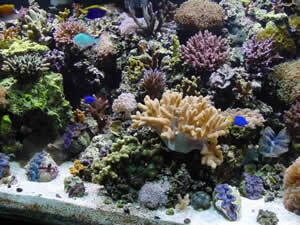 I hadn’t expected my hobby to turn into such an obsession, but since it has, it’s great that my reef tank is considered to be nice enough to be in the same category as the other outstanding tanks that have preceded mine as tank of the month…. What a compliment! 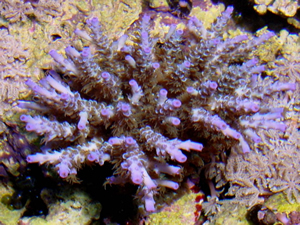 Please feel free to post any questions or comments in the discussion forum on Reef Central. 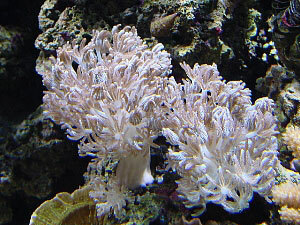 *Note: all corals are believed to be these species. If there are questions, I will do my best to answer them in the forum for the online magazine.